You may be familiar with the revolutionary Hot Hand controller; essentially, it's a device for manipulating effects parameters in real-time with hand movements that is worn like a ring and uses motion sensors. The first units designed for use with the Hot Hand controller were the Hot Hand Wah Filter and the Hot Hand Phaser/Flanger, but as this article explains, you can use the Hot Hand with other devices such as the Line 6 Pod XT Live. Now, four new Soundblox pedals have been announced that, in conjunction with the Hot Hand controller, allow access to some seriously sci-fi sonics. The Tri-Mod Flanger, Phaser and Wah have all evolved from the original Wah Filter and Phaser/Flanger, and each offers 11 different effects. The Multiwave Distortion is completely new, and offers 21 distortion effects that alongside more traditional distortion sounds includes aggressive, synth-like octave sounds and extreme foldback settings. US RRP for the Soundblox pedals is $149.99. 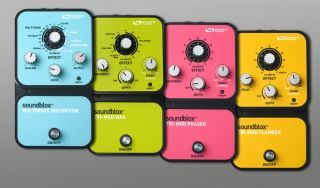 To listen to audio clips that showcase what these exciting pedals are capable of, visit the official Source Audio website.